The way in which we sell is changing, especially for women in hi-tech careers. Today’s sales environment is culture-driven, and the culture in the hi-tech industry can be a challenging place for women in leadership positions. The biggest change has been in collaborative conversation. There is no product discussion, we don’t talk about hardware, software or service. We discuss the problem or need in depth and work toward a proof of concept. Instead of selling big deals, the market has shifted towards proof of concept, subscription-based and selling to inform. It’s not just about sales anymore; it’s about sales and marketing alignment and how to bridge the gaps. 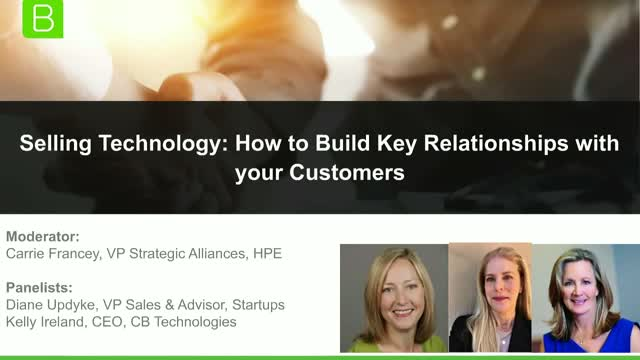 Join this expert panel with Diane Updyke, VP Sales & Advisor, Startups, Carrie Francey, VP Strategic Alliances, HPE and Kelly Ireland, CEO, CB Technologies, as they discuss these and other trends in the tech, startup and SaaS sales environment. The customer expects fast, personal and engaging experiences, integrated and aligned across touch points in real time. The Cloud brings along a paradigm shift in the way customers interact with the businesses and what businesses must be prepared for. Understand what the Modern Customer Experience is and how content and customer analytics are keys to success. Organizations need to have the right tools to capture feedback and provide needed content at each point in the life cycle. Learn more from our Panel of experts as they share their experiences, best practices, and lessons from leading Companies. Cloud Transformation has gained greater traction in the recent years. However, to propel your business to achieve the cloud profitability that you deserve, there are three core concepts that need to be understood. 1. Your business realizes that there’s an opportunity to solve a problem or add value to the lives of many customers and make a recurring revenue from it. 2. You and your team acquire the knowledge that you need to take advantage of the cloud opportunity. 3. You and your team will execute actions based on the knowledge obtained, and your profit will be directly proportionate to how many customers you empower with Cloud technologies. Join us in making you and your business cloud ready company. We look forward to collaborating with you. IoT offers incredible revenue growth potential for companies building and bringing solutions to market, and co-selling their innovations with enterprise brands. This session outlines the 7 principles of IoT, sharing IoT Solutions tackling tourism & automotive market and exploring data and analytics to help you make faster business decisions. Established IoT partners are collaborating with emerging organizations in new ways. We will highlight examples of successful organizations thriving in the ecosystem, leveraging new types of partnerships to approach solution building and solution scaling. Inspiration, empowerment and growth for women-led startups. Women In Cloud Summit celebrates the female entrepreneurs in the tech world; a source of inspiration and support that connects and empowers women in Washington and beyond, helping them to realize their potential and reach new growth through leading cloud industry, community, and government partners. Our mission is to inspire, empower and accelerate the growth for women-led technology companies. We focus on digital transformation to provide digital access, digital capabilities and connections to customers through leading cloud industry, community and government partners. The Women in Cloud Initiative is led by the Ignite WA leadership team in collaboration with Industry Partners, Microsoft Corporation, Hewlett Packard Enterprise (HPE), and Meylah.